This page provides basic information for the HIS Research Project. Newer information is available at CUAHSI website www.cuahsi.org please update your bookmarks to our new location! Some functionality is retained for archival purposes. HIS Central — contains copies of metadata which facilitates searches; works like a search engine, in that it harvests metadata from the data servers and allows it to be efficiently searched by the clients. HydroServer — stores, organizes and publishes data; allows metadata to be harvested by HIS Central and data to be shared with clients. Clients (such as HydroDesktop) — gives users a convenient interface to access data; retrieves metadata from HIS Central and retrieves data from HydroServers. 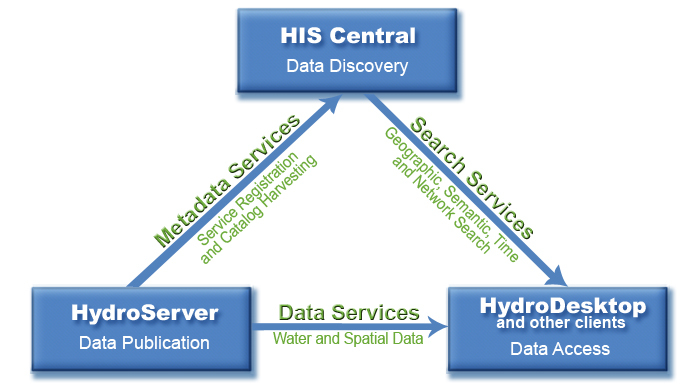 Data Services — allows water and related spatial data to be retrieved by the client (such as HydroDesktop) computers. Search Services — allows the client computers to perform searches of the search catalog at HIS Central. Metadata Services — allows HIS Central to retrieve the metadata necessary to build the search catalog. that make-up the core of CUAHSI-HIS. What you can do with CUAHSI-HIS? Data Users — search for data, retrieve data, organize data, analyze data and/or use data for modeling. Data Publishers — organize data, store data, and make data available to others. Tool and Technique Developers — create and share additional tools and techniques that are compatible with the CUAHSI-HIS system. While the CUAHSI-HIS team has developed many of the key tools and techniques for HIS, the team is only producing a few of the many possible pieces that could be incorporated into this system. This leaves open numerous opportunities for others, throughout the hydrologic community, to contribute to HIS, by developing additional tools and techniques. What the CUAHSI-HIS team is doing for you? The CUAHSI-HIS team has developed, and continues to make improvements to, a standards-based system for storing, managing, organizing, indexing, documenting and sharing data. In addition, it has developed, and is continuing to develop, tools and techniques for implementing many of the key pieces of this system. Finally, the team is providing on-going community support via numerous channels, including: forums/wikis, workshops, papers and presentations.